Sorelle Friedler is an Assistant Professor of Computer Science at Haverford College and an Affiliate at the Data & Society Research Institute. Her research focuses on the fairness and interpretability of machine learning algorithms, with applications from criminal justice to materials discovery. 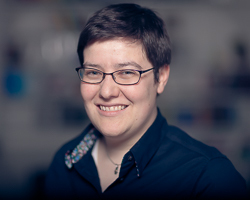 Sorelle is a Co-Founder and Executive Committee Member of the ACM Conference on Fairness, Accountability, and Transparency (FAT*) as well as a former Program Committee Co-Chair of FAT* and FAT/ML. She has received a Fellowship and NSF grant for her work on preventing discrimination in machine learning. Her work on this topic has been featured in IEEE Spectrum, Gizmodo, and NBC News and she has been interviewed about algorithmic fairness by the Guardian, Bloomberg, and NPR. Sorelle is the recipient, along with chemistry professors Josh Schrier and Alex Norquist, of a DARPA contract and two NSF Grants to apply data mining techniques to materials chemistry data to speed up materials discovery, using interpretable machine learning techniques to inform scientific hypotheses. One paper on this work was featured on the cover of Nature and was covered by The Wall Street Journal and Scientific American. Before Haverford, Sorelle was a software engineer at Alphabet (formerly Google), where she worked in the X lab and in search infrastructure. She holds a Ph.D. in Computer Science from the University of Maryland, College Park, and a B.A. from Swarthmore College. DARPA Synergistic Discovery and Design (SD2) (2018 - 2019): TA2+TA3: Discovering Reactions and Uncovering Mechanisms of Hybrid Organohalide Perovskite Formation. Joshua Schrier, Sorelle Friedler, and Alexander Norquist. $3,604,943. NSF DMR-1709351 (2017 - 2020): CDS&E: D3SC: The Dark Reaction Project: A machine-learning approach to exploring structural diversity in solid state synthesis. Joshua Schrier, Sorelle Friedler, and Alexander Norquist. $645,288. NSF IIS-1633387 (2016 - 2019): BIGDATA: Collaborative Research: F: Algorithmic Fairness: A Systemic and Foundational Treatment of Nondiscriminatory Data Mining. Suresh Venkatasubramanian, danah boyd, and Sorelle Friedler. $953,432 (Haverford portion: $172,742). Knight News Challenge Prototype Fund (2016): Could your data discriminate? Sorelle Friedler, Wilneida Negron, Surya Mattu, Suresh Venkatasubramanian. $35,000. Data & Society Research Institute Fellow (2015 - 2016): Preventing Discrimination in Machine Learning: from theory to law and policy. $10,000. NSF DMR-1307801 (2013 - 2016): The Dark Reaction Project: a machine learning approach to materials discovery. Joshua Schrier, Alexander Norquist, and Sorelle Friedler. $299,998. Sorelle A. Friedler, Carlos Scheidegger, Suresh Venkatasubramanian, Sonam Choudhary, Evan P. Hamilton, and Derek Roth. A comparative study of fairness-enhancing interventions in machine learning. In Proceedings of the Conference on Fairness, Accountability, and Transparency (FAT*), 2019. Richard L. Phillips, Kyu Hyun Chang, and Sorelle A. Friedler. Interpretable Active Learning. Presented at the ICML Workshop on Human Interpretability in Machine Learning, Aug. 10, 2017. Mohammed Waleed Kadous, Isaac Richard Taylor, Cedric Dupont, Brian Patrick Williams, Sorelle Alaina Friedler. Permissions based on wireless network data. US 20130244684 A1. Publication date: Sep. 19, 2013. Sorelle Alaina Friedler, Mohammed Waleed Kadous, Andrew Lookingbill. Position indication controls for device locations. US 20130131973 A1 (also WO 2013078125 A1). Publication date: May 23, 2013. Adam Marcus and Ivan Oransky. What scientists could learn from startups. The Week and STAT, May 12, 2016. Daniela Hernandez. Why Machines Should Learn From Failures. The Wall Street Journal, May 6, 2016. Jordana Cepelewicz. Lab Failures Turn to Gold in Search for New Materials. Scientific American, May 6, 2016. Philip Ball. Computer gleans chemical insight from lab notebook failures. Nature News, May 4, 2016. Lauren J. Young. Computer Scientists Find Bias in Algorithms. IEEE Spectrum, August 21, 2015. Julianne Pepitone. Can Resume-Reviewing Software Be As Biased As Human Hiring Managers? NBC News, August 17, 2015. Kiona Smith-Strickland. Computer Programs Can Be as Biased as Humans. Gizmodo, August 16, 2015. Sam Levin. A beauty contest was judged by AI and the robots didn't like dark skin. The Guardian, September 8, 2016. David Ingold and Spencer Soper. Amazon Doesn't Consider the Race of Its Customers. Should It? Bloomberg, April 21, 2016. Rose Eveleth. The Inherent Bias of Facial Recognition. Motherboard, March 21, 2016. Laura Sydell. Can Computer Programs be Racist and Sexist? NPR, March 15, 2016. Lauren Kirchner. When big data becomes bad data. ProPublica, September 2, 2015. Hal Hodson. No one in control: The algorithms that run our lives. New Scientist, February 4, 2015.